This article by Dave Murphy is re-posted from EcoWatch. Ever have that creeping feeling that those in charge of watching over our food supply or making recommendations about what constitutes a healthy diet have lost their way? 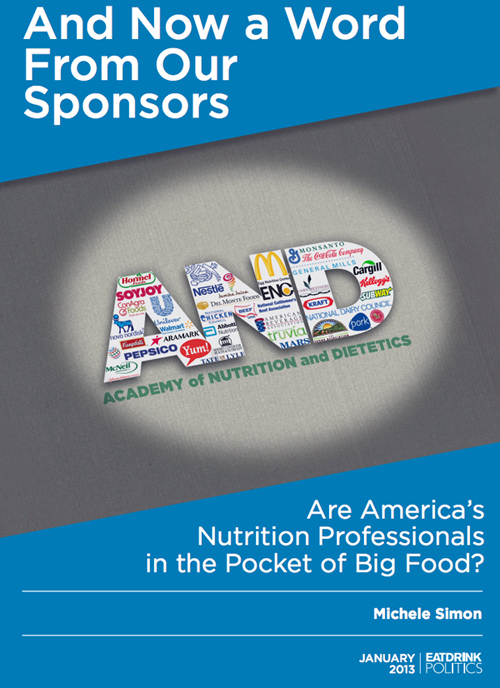 Sadly, the Academy of Nutrition and Dietetics’ looks like it has fallen sway to big money corporate contributions and sponsorships from Big Food like junk food giants Coke, Pepsi and Nestlé. The largest trade group of nutrition professionals—the Academy of Nutrition and Dietetics—has a serious credibility problem. In a damning report released yesterday, industry watchdog Eat Drink Politics examines the various forms of corporate sponsorship by Big Food that are undermining the integrity of those professionals most responsible for educating Americans about healthy eating. Sponsors and their activities appear to violate the Academy’s own sponsorship guidelines. 4) provide better leadership on controversial nutrition policy issues. Michele Simon’s report on the Academy of Nutrition and Dietetics is thoroughly researched and expertly points out the different ways in which the nation’s leading nutrition organization harms its reputation, efficacy and members by forming partnerships with food companies that care more about selling products than they do about improving the health of Americans. Anyone concerned about public health will realize that the Academy of Nutrition and Dietetics is in dire need of systemic change if it hopes to take a leadership role and be taken seriously as the home base of the nation’s nutrition experts. How does the CSPI “Food Police” compare, seems like they sold out quite a bit a few years back.